In the past, Alex has asserted that comics fans have been stereotyped as smelly folk; fortunately, it seems as though someone is finally doing their part to save comics fans who like Star Trek from an unpleasantly pungent fate. I'm a few months behind the times on this one (as usual), but a company called Genki Wear has released a line of Star Trek-themed colognes and perfume, which are guaranteed to make us carbon-based lifeforms smell a little less like ugly bags of mostly swamp water. The names of the fragrances are priceless. "Red Shirt - Because tomorrow may never come." "Tiberius - Boldly Go." "Pon Farr - Drive him crazy." 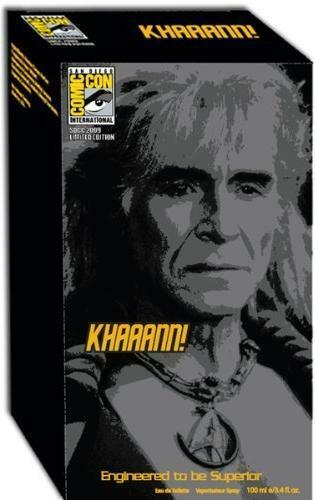 Also, there's a top-secret cologne that I received as an early Christmas gift: "KHAAANN! - Engineered to be superior." I say it's top-secret because it's a limited edition that was supposedly only available at Comic Khan. Erm, Con. Genetically engineered to possess incredible strength and superior intellect, he was revived from 200 years of suspended animation by Captain James T. Kirk, and with the help of the Genesis Device, became Kirk's greatest enemy. KHAAANN! is a cologne that never surrenders; allowing you to be as daunting and assertive as a bare-chested man can be. KHAAANN! lunges forth with a clatter of citrus and bergamot, followed by agressive midnotes of agar wood and vetiver, creating a long-lasting incense-infused fragrance that slowly dies down to a warm and sensual smoky ambergris scent. Like a cold dish of revenge, KHAAANN! cologne sets a tone and tells the world you're a man limited by nothing but two dimensional thinking. Now, I'm not normally a fan of stinkwater, but this stuff actually smells quite nice. In a manly way. Plus, it's Star Trek! Simply slapping the Star Trek logo on a product doesn't automatically make it good, mind you; however, this is a rare cologne that I actually like, and the bottle should be fun to hang on to as well. Mostly, though, I can't wait for the day when somebody asks me, "What cologne are you wearing?" and I can legitimately respond with, "KHAAANN!"